Few of us get to experience real brushes with greatness. Sure, I once stood mere feet from one of my favorite actresses, Maggie Gyllenhaal (Jewish! ), at a party in Seattle. I once attended the same film screening as actor Jason Schwartzman (also Jewish!). And actress Miriam Shor (Jewish for sure! ), who has appeared in such pop culture touchstones as “Hedwig and the Angry Inch” and TV Land’s delightful sitcom “Younger,” is the daughter of family friends. But none of this could compare to the life-changing day — July 26, 2018 — that I received an email from the one (the only!) Abe Steinman. I came across your two articles about “Rabbi Sid, The Rappin’ Rabbi” and I wanted to let you know that my two best friends, Herb Brownstein and Sid Schwartz, wrote that song, and I produced and directed the video that is now posted on YouTube. Simply said, both the song and the video were the product of a bunch of creative Jewish (and one Italian) guys bouncing ideas off each other and coming up with something amusing. In the end, it was all about the laughs. This was not our day job. Herb and Sid, the songwriters, were longtime partners in a Ladies Dress Manufacturing Business and I used to sell them all their buttons, zippers and trims. We are all now retired. Sid lives in Florida, Herb moved to be with his kids in Toronto and I am still in Montreal. As it turns out, we all get together once a year every summer, in the Laurentians north of Montreal, and we all happen to be there this week until Sunday. So if you want to find out the “Real Behind the Scenes” of “Rabbi Sid, The Rappin’ Rabbi,” you are welcome to get back to me … and we would all be happy to give you the “ehmes” [truth in Hebrew]. For those of you just tuning in: In June of 2016, I wrote an affectionate ode to the phenomenon of rapping clergy. In that piece, I focused the majority of my attention on a music video titled “Rabbi Sid, The Rappin’ Rabbi.” Little did I know that the grandson of Jerry Glantz, who played Rabbi Sid, would contact me in November of the same year and offer to tell me all about his zaida (Yiddish for grandfather). Through my interview with Michael, I learned that Jerry was a real mensch: a big-hearted, community-minded, fun-loving person who cared about family and tradition but wasn’t snobby or judgmental about how other people practiced Judaism. I was thrilled to dive deeper into the “Rabbi Sid” story but figured that interview with Michael would be, journalistically speaking, the end of the matter. Just imagine how pleased I was to be proven wrong! I reached Abe, Sid, and Herb at their yearly reunion venue in the Laurentian Mountains. They were jovial, on occasion politically incorrect, and not shy about interrupting each other to fill in more of the story. I liked them pretty much instantly. The guys agreed that Herb was the one to set the “Rabbi Sid” juggernaut in motion. It all started with the title, which “just flowed,” they said. First, Herb wrote a few verses; then Sid, the team’s “music guy,” worked on a tune. “I remember there was Chinese food involved,” he said. Takeout boxes littered the creative space. I mean, honestly — it was a Jewish artistic venture. How could Chinese food not be involved? The studio where “Rabbi Sid” went from words and notes on a page to recorded reality belonged to Sid’s brother-in-law. The guys told me it wasn’t a particularly long session, though two different versions of the song were recorded. The “Italian guy” Abe had mentioned in his email — his name was Tony — actually performed the Rabbi Sid vocal part. (Jerry Glantz lip-synced in the music video.) Tony wasn’t Jewish, but he did live in the Hasidic part of Montreal, so he was able to recreate the distinctive (and, yes, stereotypical) cadences and intonations of a Hasidic rabbi. Sid’s father even played clarinet on the track. 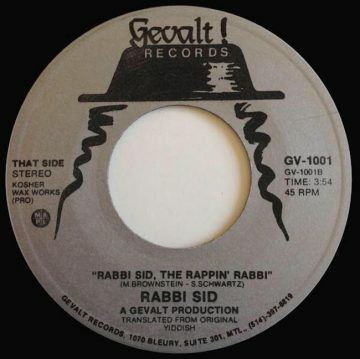 “Rabbi Sid” was released via the novelty label Gevalt! Records, in 45 rpm format. Six hundred copies were printed, and Abe, Sid, and Herb still have some lying around. (At the end of our interview, they promised to send me one.) If you check out the music video on YouTube, you’ll notice one commenter claims “Rabbi Sid” used to play on the radio daily in the Montreal area. That might be an exaggeration, but according to the guys, the song really did get airtime. 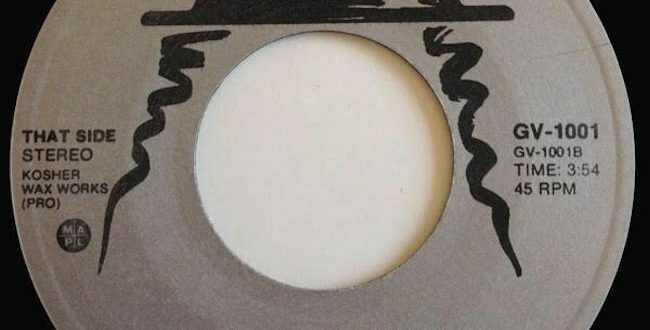 A local DJ would apparently give the record a spin whenever a Jewish holiday came around — and if you know anything about Judaism, you know there are a heckuva lot of those. Auditions were held for several key roles, including the two young black women who appear in the video’s opening scene. Twin sisters who went by Freakie Dee and Freakie Lee, and were aspiring rappers, won the coveted roles. Unpaid extras played other members of the black community. Rabbi Sid’s posse of popping and locking dancers, who were not Jewish (and wore fake earlocks for the shoot, as Michael Aronovitch had told me), were also cast through auditions. The casting of Freakies Dee and Lee relates to a point I raised in my initial “Rabbi Sid” article: Through 2018 eyes, the music video uses broad stereotypes to portray two entire people groups (the black and Hasidic communities). During our call, Abe, Sid, and Herb acknowledged this, though they said the whole thing “started off as a comedy project” and was “never done with malice.” An equal opportunity offender, the video doesn’t just stereotype black people — it also pokes fun at rabbis (especially out-of-touch rabbis who think they’re cool). Now that “Rabbi Sid” has found a new audience for a new century, what’s next for the legendary rabbi/emcee? “Rabbi Sid on Ice!” the guys suggested. Maybe also an animated Cartoon Network show? Or a stuffed toy that, when you squeeze it, says things like “Don’t waste your time if he’s a goy” or “Do the hustle and the bustle”? There’s no telling how far a revived Rabbi Sid could go in today’s diversity-focused pop culture landscape. My humble suggestion: Rabbi Sid, in a new incarnation, works Jewish weddings as both officiant and entertainment. Hey, anything’s possible, right? Previous Ask An Atheist: What Does Civility Look Like? Next POEM: The mother or the egg?